First, it's important to note the hypocrisy of each major celebrity that has waged a war on Canadian oil and North American energy independence. Leonardo DiCaprio visited the Alberta oil sands near Fort McMurray via plane in a joint tour with the Sierra Club. Before visiting the oil sands, DiCaprio had to fly from his million dollar mansion in California to Alberta on a private jet powered by gallons of fossil fuel. Mr. Gatsby is a devout environmentalist who has produced documentaries like The 11th Hour and forked over millions to build an eco-friendly resort in Belize. Unfortunately, DiCaprio's private jet creates an unnecessary excess of carbon waste over top of the daily commercial flights from California to Alberta, all because the superstar refuses to fly with average commoners and peasants. To top off DiCaprio's larger than average carbon footprint, the actor recently signed up for a space flight with Virgin Galactic. Both James Cameron and Neil Young have also visited the oil sands via planes and private jets. In fact, Neil Young also used a gasoline powered bus during his last North American tour, while his band used electrical outlets connected to coal and oil power plants. None of these hypocritical celebrities will admit that fossil fuels help transport food, water, and medical supplies around the world. It's because of fossil fuels that doctors from around the world are able to help contain the Ebola outbreak in Africa. Most of the medical supplies they use also rely on petroleum based materials, like plastic. If Ebola were to ever find its way across the pond, it would be petroleum technologies that save us from a pandemic. Something else these celebrities don't understand is that people who support oil production also realize that fossil fuels harm the environment. We get it. Oil is bad, which is why we would all support affordable alternatives. Unfortunately, we haven't arrived at that point in history yet. For now, we still need fossil fuels. When someone finds a truly safe and affordable source of energy, let us know. Now, lets get to the juicy parts of this war on North America's energy industry. Journalist James O'Keefe recently tricked actors Ed Begley Jr. and Mariel Hemingway into accepting fake Middle Eastern money to help fund an anti-fracking film in Hollywood. Neither Begley or Hemingway knew they were being duped and secretly filmed. Both actors agreed to hide the fact that their film would be funded by Middle Eastern interests. O'Keefe also captured Hollywood producers explaining methods of hiding the funding, referring to various “non-profit groups” that would help keep Middle Eastern funding under wraps. The full undercover video can be watched right here. The idea that Middle Eastern countries like Saudi Arabia would invest in such propaganda makes sense. Saudi Arabia is a major oil supplier to both the United States and Canada. They also ship some of their oil to China, where Canada's contentious Northern Gateway pipeline is eventually supposed to ship Canadian bitumen. Another ominous prospect is Russia. The country just signed a 30 year gas contract with China. As the United States begins off-shore drilling and various fracking ventures on its own soil, the country poses an economic threat to Russian gas and oil exports. With growing oil production and a Prime Minister scouring the globe for potential buyers, Canada is also becoming a significant industrial threat to Russia and Middle Eastern oil suppliers. Canada is currently the world's sixth largest oil producer, but over the years Canada has cranked up its production. 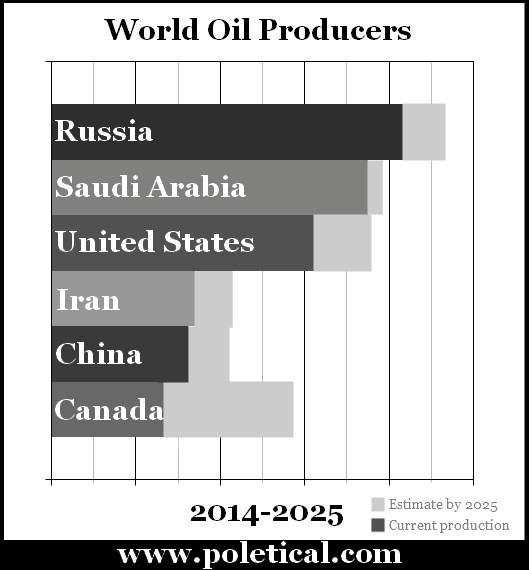 The top three oil producers are Russia, Saudi Arabia and the United States. By 2025, it's estimated that Canada could push past Iran into fourth place and eventually into third place – ahead of the United States. Canadians should consider that Canada has also become a significant economic threat to the United States. Organizations like ForestEthics are indirectly funded by American billionaires like Tom Steyer and receive official support from the Tides Foundation, an organization funded by several international enterprises. ForestEthics is one of the American organizations responsible for tying up the Northern Gateway by filing lawsuits against the National Energy Board and Federal government. Another organization funded by Tides is the Natural Resource Defense Council (NRDC) – but we'll get into that shortly. ForestEthics claims credit for almost 90% of the “letters of comment” sent to the National Energy Board in opposition to Northern Gateway. The organization's 2012 tax returns from the IRS reveal that 3.3 million US dollars were funnelled into Canada by ForestEthics to oppose Canadian oil production between 2009 and 2012. ForestEthics also takes responsibility for organizing First Nations protests against several Canadian pipelines, including Line 9. The full rundown of ForestEthics' money and influence can be seen in this piece written by Vivian Krause for the Financial Post. Tides' refusal to disclose the origins of its donors leaves the door wide open to speculation. Remember that photo of George W. Bush holding hands with a Saudi king? Despite their differences, the United States and Saudi Arabia have been strong energy partners since the 1970s. Both countries are in a constant battle between friendship and feud. In the grand scheme of things, Canada poses a significant threat to this long energy relationship between the United States and Saudi Arabia. An important fact to remember is that the Keystone XL pipeline threatens to further reduce America's dependence on Saudi oil. The energy relationship between the US and Saudi Arabia is complex and requires a delicate balance. There can't be too much oil and gas production in the United States, but there is even less tolerance for the flow of Canadian oil into the United States. The last thing Saudi Arabia wants is Canada providing a new path toward American energy independence. The Tides Foundation hosts conferences like the Tides Momentum Conference. Billionaire green activist, Tom Steyer, has been a speaker at the conference. Tom Steyer is a well known American billionaire who has recently made headlines for his attacks on the Alberta oil sands and the Keystone pipeline. Along with being a supporter of Tides, Steyer attends ceremonies and events like the Global Green Millennium Awards, where he meets and mingles with Hollywood big shots and actors like Ed Begley Jr., Fran Drescher and Ed O'Neill (Al Bundy). Leonardo DiCaprio's 11th Hour featured Matt Petersen and Global Green helped roll out the red carpet for the film's premier. Matt Petersen is a member of Greeenstar's advisory board, along with Aimee Christensen, who has worked closely with the Rockefeller Brothers Fund as an environmental strategist through her company, Christensen Global Strategies. Between 2006 and 2007, Christensen worked for Google where she developed strategies to deal with global warming and poverty. Both Aimee Christensen and Ed Begley Jr. are on the board of directors for yet another environmental group called ecoAmerica. Greeenstar (three Es) is dedicated to green living and green energy. It was founded by Dr. Charles Roberts, who claims that “meeting Leonardo DiCaprio, actor and environmentalist, in 2008, was a turning point” in his mission to save the planet. One of Greeenstar's partners and donors is the Natural Resources Defense Council, the largest environmental organization based in Washington DC. The NRDC touts its legal team of 400 attorneys and credits them and their “courtroom clout” for winning lawsuits against corporations and special interest groups that harm the environment. The NRDC has also teamed up with Green Day to launch a website dedicated to creating awareness of US petroleum dependence. NRDC is also an official partner and donor of ecoAmerica. The NRDC is one of the organizations that receives funding from the Tides Foundation. The NRDC is not only funded by Tides, it was initially started as a side project by Tides and received a start-up grant from the Tides Center. To see all of the other groups funded by Tides, click here. To read more about Tides' other projects and offshoots, like the Sierra Club, click here. All of the major environmental advocacy groups operating in the United States are interconnected. All of the founders, CEOs, partners and donors of these organizations have – at one point – collaborated or joined forces for various ventures and projects. All of these environmental organizations have directly and indirectly influenced useful idiots in Hollywood, like Leonardo DiCaprio, Ed Begley Jr., Matthew Modine, and Marial Hemingway. None of that would be a big deal if all of these major environmental groups didn't have their roots planted in soil fertilized by Tides money. Unfortunately, all of these groups owe their existence to Tides. One direct and overt Canadian connection to Tides is Joanie Bronfman, who sits on the Tides board of directors. She is a member of Canada's wealthy Bronfman family. The Bronfmans are often referred to as the Canadian Rockefellers because of their significant wealth, influence and activism. The Tides Foundation and the Tides Center have weaved a complex web that stretches across North America. The most troubling fact is that a majority of Tides funding can't be directly traced. Most of the donations and funds that go to Tides are filtered through the enterprises and subsidiary groups of various organizations and individual investors. To make its web even more complex and difficult to track is Tides' strategy of creating several projects and advocacy groups with different names, different CEOs and different environmental directives. For good reason, some critics of Tides have referred to the organization as a massive money laundering operation. Spreading their message and fuelling their fear campaign is at the heart of their agenda. Hollywood is filled with celebrities with star power and producers with money. The Tides foundation has been in business for 35 years and as long as it keeps finding representatives in Hollywood, it will be in business for 35 more – or until it achieves all of its objectives.